The Bolthole • View topic - It's Competition Time!! An area for literary challenges and ongoing competitive events of all kinds. Afternoon all. As I write this at 1113am on a wet Friday morning, the rain lashing against the windows and my dog steaming gently in the corner, it occurs to me that at present I have no prizes to give away. So instead you will have to compete for the chance at glory. As this is the first competition we have run for a while, and I am not sure of the levels of participation, I am going to keep it simple. The story must be on the topic of regeneration. The winner will be decided by a vote. The voting will start on the 1st August and run until the following Monday when a winner will be declared. I collapse and turn. Looking up, the beast towers over me. It’s a monstrous man-shaped flame. But past that I see a twin-headed eagle on its breast and I realise my mistake. ‘The Emperor protects’, I whimper. I slowly raise my eyes to meet it's gaze and I sense it's judgment. In the reflection of it's artificial eye I see it as it seems me. A whimpering fool. It points at me with a limb encased in fire. It says something. The sound reverberates through the tunnel and all I hear is a distorted booming noise. I try to shout out an apology, but it does not care. A see a spark from it's finger, I smell promethium, and I am brought to screams by a scorching pain which caresses my skin then penetrates my body. The brickwork of the tunnel spirals in front as it narrows to a man-sized black hole. It’s only twenty paces away, thirty at most. If I can make it there, I know that I will survive; I just know it. The stinking sewer water at the floor soaks up my administratum issue trousers. They were pristine only hours earlier. Why do I think that now? No matter. The water soaks up to my shins, I feel my pace slow. The water is an excuse; I’m tired. I repeat the mantra: mind over body, mind over body. I take one quick glance over my shoulder as I run forward. The tunnel curves. I can see tall flame-cloaked shadows reflected on the walls, which grow and grow. This is no illusion, I have seen the beasts which cast the shadows and they are giants. And they are closing in on me. The pregnant clouds birth their young. Tear drops of fire plummet towards the ground. Underneath they glow a white bright heat which is so sharp that I wince, but I unable to look away. Atop they are trailed by a thick black smoke. They punch into the ground penetrating metres into surface, wherever they land. Their impact sends up a second rain of rockcrete debris which falls heavily and kills indiscriminately. I climb out of the transporter and run for the nearest sewer hatch. I’d determined that heading underground was my best chance for survival. My eyes lock on a smouldering crater to my right. Within the smoke and ash climbs out a metallic-grey humanoid creature. As it stands upright it spots me with its electronic green eyes and I receive its message of malevolent intent. It looks away from me, down at the top of its forearm. It looks like it is typing in a sequence of commands on its vambrace, and I’m sure it is, because it then its body sparks and flickers into a bright orange-yellow flame. It looks back as me, as four of its kin arise from behind it, and I run with all my energy for my freedom without taking a single look back. As I close the sewer hatch, I think to myself ‘vile xenos have noticed our vulnerability and they have come to pick the bones of us’. Two lunar cycles later the capital communications malfunction. The system refuses to turn off, even when powered down, and those that were off burst into life with white hissing static. It becomes impossible to send or receive orders or requests within five kilometres of the city perimeter. Within hours the hissing stopped as it was replaced by a soothing melody that carries the twang of something very old. The music continues on ceaselessly for several days, by which point it becomes tiresome from repetition. The tune then changes to something I can only describe as sorrowful. It is accompanied by gathering dark clouds overhead. The music grips something in my heart and pulls. I weep uncontrollably. I have to get away from it. I jump in to my personal carrier unit and make a demand to the control servitor to drive out of the city. As you command, he replies. As we travel, through blurred vision I see that my experience is not singular. The people, all of them, wherever I gaze, are weeping. Even as I rationalise that it is mechanical tears induced by a trick, I feel that it is so real. I feel that the music is revealing a greater truth that falls just beyond my grasp. Is the truth too far away or have I fallen short? I shake the thought away with by moving my head side-to-side. In that moment I realise that the music has stopped. The city is as silent as death. I then look up to the clouds and notice that they are accentuated by an unnatural fiery orange cracking light. Like a mechanical spider of sorts the relay satellite gracefully dances in orbit around the world, gorging on electrical signals received from deep space and weaving out audio messages which are collected and processed by trained servitors. That is, until it stops. I ask Magos Bilerion how long it will take to repair the satellite. I am not prepared for her reply. ‘It cannot be repaired, because it is no broken. It has simply gone’. In that moment I realise that something is very wrong. I remember that there was excitement at first. Smiling, laughing, and hope. Hope for something new. No longer slaves to an empire that had all but forgotten us. For three hundred years we had thrived on our own. It was with this outlook that we sent the communique. The free people of Antonius IV of the Antonius-Prime System declare our intention to seek independent fulfilment from this moment forward. We reach out to the Empire with hands of friendship and we patiently await your proposals for diplomatic relations that will benefit all. We heard nothing from the Empire and life moved on. Last edited by Rob P on Wed Nov 22, 2017 10:29 pm, edited 1 time in total. Thanks for your entry Rob. Here's mine! Cervantes Knellrider looked askance at the speaker. Sergeant Theodore was a grizzled Ultramarine veteran. His face was lined with age and contoured with scars. His forehead was pocked with long service studs. 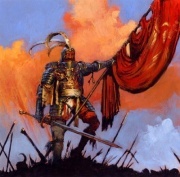 His seventh company shoulder pads were bordered with yellow trim, and the helmet cradled in his arm was a deep crimson. ‘Especially not since that.’ Theodore continued. That was hard to miss. Cervantes inclined his head to follow Theodore’s gaze. The sky over Safehold was black as pitch – the cemetery-worlders dimmed their lights at night as a sign of respect to the countless dead who littered the surface – and so it was as good a place as any to gaze upon the insanity of the Cicatrix Maledictum. The tear that had split the galaxy in two and thrust the fragile Imperium of Man ever closer to the edge. Even at this distance the kaleidoscope of colour could be seen to billow and change with every heartbeat. Purple clouds of gas fizzled and wept into streams of yellows and blues which faded into green sparks. The whole ominous body was stretched across the nights sky, its very presence a menacing reminder of the dark situation facing humanity. ‘I know.’ Cervantes replied. As Chapter Master of the Astral Knights Adeptus Astartes he was not used to having his actions so openly approved of, but here, in this place… well. Cervantes turned away from the ghastly nightmare that was the galactic warp rift and returned his gaze to the reason he had come on this pilgrimage to this sombre world far out on the Eastern Fringe of the galaxy. The wreck of the Astral Knights battle-barge Tempestus towered above them, its twisted prow clawing drunkenly skyward. Preserved by the Adeptus Mechanicus after being recovered from the crippledd necron world engine Borsis, and even ruined as it was by the colossal impact it sustained when the former Chapter Master of the Astral Knights, Artor Amhrad, had hatched the desperate plan to ram the world engine, it was still impressive. Cervantes could see where the impact had ripped over the metres-thick void armour and exposed the decks. He could see where the mighty gauss cannons of the necron foe had vaporised whole sections, shredding each part down to its constituent atoms. Cervantes nodded at the departing Sergeant and then walked slowly towards the ruin of the Tempestus. Sebastus Weaver, 3rd Company Captain of the Astral Knights was waiting for him, his silver-white plate glowing faintly in the gloom. They walked in silence together, each lost in their own thoughts. At the base of where the Tempestus had been erected stood a towering statue. Five metres tall, it depicted not some hero from chapter legend, but a nameless marine clutching a boltgun, faceplate grill set in a timeless snarl. Around this statue, ranked alphabetically into neat rows, were seven hundred and seventy-two stones, each two metres tall, each engraved with the name of an Astral Knight. Cervantes knew all their names already. They were permanently marked in his eidetic memory. But he still stopped in front of each stone and read them, their position within the chapter and the high gothic script, the same on every stone. We will remember them. Afterwards, having said his farewells to Sergeant Theodore, Cervantes and Sebastus sat side by side in the thunderhawk gunship as it screamed through the night sky above Safehold. ‘How could I forget?’ Cervantes replied. It had been a homecoming like no other. Obsidia was not their home anymore. Following the demise of the Astral Knights, the Sable Swords Chapter had been installed to replace them in their fortress monastery and had taken over their territory. The newly reformed Astral Knights had been welcomed by the Sable Swords with open arms. And yet there had been a tension in the air, perhaps because Cervantes and his brother primaris remembered Obsidia when the banners above the monastery had been blue, not black. Perhaps because the Sable Swords felt some residual guilt at the manner of their occupation. Regardless, they had preserved the relics and annals of the Astral Knights and for that, Cervantes was grateful.